I collect vintage hair combs and although my collection is small and much loved, I am slowly adding to it. To the hair comb collectors out there, how do you display your combs? I currently have mine in a floor display case with glass top, along with my collection of brooches, but I would love to hang them on the wall in a display case/shadow box. Any ideas? Thanks!! I'd maybe ask an antiques dealer that specialised in combs on storage tips, they'd know about what materials might be best and what to avoid. I like the idea of shadow boxes but they might be better supported somehow to show them off and protect them at the same time. Just a thought. I second what Liluri posted. I would also like to add that I would Love to see pictures of both collections. Thank you Liluri and Coppercurls! I found a wall display which should work out nicely for my hair combs! I'll work on getting pictures of my collections. I am certainly looking forward to pictures of your hair comb collection, Tammy, and I am sure it is quite lovely! Yes please for pictures, Tammy Sue! 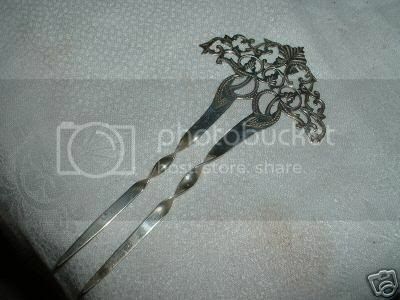 I have one vintage hair fork that I won on ebay, and that I think is gorgeous... I love it so much in fact I haven't dared to wear it in public yet, for fear that I'd lose it! Levelek, that fork is just gorgeous! !